We all know the story of John Wilkes Booth and his historic assassination of President Abraham Lincoln. But what about the story of his brother Edwin? Do you know his tale? 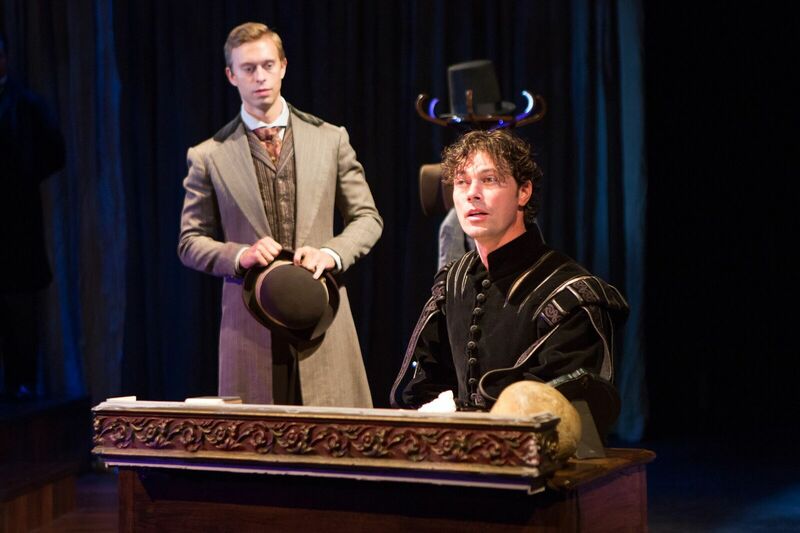 In the ambitious new musical Edwin, The Story of Edwin Booth, Edwin's life is brought into the spotlight through surrealistic storytelling as Edwin deals with the aftermath of the incident while being haunted by his past. With music by Marianna Rosett and book and lyrics by Eric Swanson, Edwin, The Story of Edwin Booth follows the titular character on the verge of a performance of Hamlet to a sold out crowd. But are they there for a show or his Edwin's head? Through visitations from his deceased family, flashbacks, and a heavily reliance on Shakespeare, the musical has a daunting tone centered on a man with little to lose. With minimal stakes surrounding the present, most of the action takes place in the past. We are granted insight to the events that shaped Edwin, with glimpses into his various relationships, but the interesting element that needs a stronger shape is Edwin in his dressing room in the present. That's where the dramatic journey truly is. As it stands now, there is a ton of air within the dramatic tension that is forced at best. Swanson implements an array of Shakespeare into the libretto. From Richard III to King Lear to Hamlet, he uses them more as a device than a clever way to further the plot. It's evident where the parallels between Shakespeare and Booth's own life are but it's never a smart move to hammer the idea over the audience's head. It's sadly used as a crutch at best. When it comes to the score, Rosett's music is epic with a tinge of Sweeney Todd. Whether deliberate or not, it's easy to compare many moments to the Sondheim classic. The opening for starters. While the sound fit the story, the lyrics from Swanson were sloppily predictable. And many times they pulled focus for being a tad cheesy. The majority of the score falls into the slower tempo category, forcing the songs to blend into one another. Edwin desires a stand-out number. It doesn’t have it now. It's not always easy to play the title character of a play. Especially if they are central to the entirety of the plot. Dana Watkins' resounding performance was reminiscent of Hamlet himself. Watkins tapped into the madness of Edwin, blending psychosis with the wavering insecurities inside. With history playing an integral role in this story, this show was all about the relationships between Edwin and his family. But the strongest dynamic was between the duo without blood ties but a rich history. All revealed through plot twist. Watkins and Ben Mayne as Rob had the most engagingly active material. It's where the intrigue of the story lived. Mayne brought a boyish charm that balanced out Watkins’ robust demeanor. As Edwin's love Mollie, Patricia Noonan was a bright light in the darkness. As the great player Junius Booth, Paul DeBoy was the show's clown. We briefly watched Edwin live in his father's shadow and DeBoy proves why. Though clarity in her vocals was lacking, the maternal elements in Deanne Lorette's performance defined the importance she had on Edwin's life. Todd Lawson's character study of John Wilkes Booth was strong, putting the focus on a bitter dark side. Though he was rarely seen, Adam Bashian as June was pushed to the back far too often, questioning the necessity of character. It's one thing to create stunning stage pictures, but as a whole, director Christopher Scott offered some sloppy staging. Scott defied the rules of the world in his staging, often asking Edwin to cross into memory when it wasn't warranted. But that's the struggle when the stage is laid out with defined areas. Credit should be given to the ability of Scott to bring out even tiny bursts of humor and for assembling a cohesive creative team. Chad McArver’s harmony in design elevated the production to the next level. The Theatre at St. Clements can be a challenge but McArver used the height well utilizing fabric drapes that he lit beautifully. McArver's use of color helped the surreal nature of the story. McArver and costume designer David Zyla stuck to the period, a necessity to storytelling. Edwin, the Story of Edwin Booth looked like a well-polished production but the material felt like a first draft. There was much to be desired yet an abundance of fluff that needs to be axed. Not every moment needs a song and if the story if being told nonlinearly, things need to be shifted, especially at the end. And perhaps a sleeker title is in order. Booth’s story is one worth telling. Perhaps just not in this current format.